JungleMail for Office 365 comes with several types of built-in email templates and an option to create your own ones in the Drag & Drop Builder. In this tutorial, you will learn how to work with templates. You can access the built-in templates in JungleMail 365 from the Templates tab. Here you will find three template subcategories. Let's have a closer look at each one of these. My Templates - under this tab, you will find the templates you have created in our Drag & Drop Builder. Drag & Drop Templates - here you will find the built-in templates which you can open, change and save as a custom template of your own. Rich Text Templates - under this tab, you will find the built-in Rich Text Templates that you can use for your email campaigns. To get the most out of this template type, we'd recommend a basic knowledge of HTML. Note: built-in templates cannot be modified, but you can load any built-in template, change it according to your needs and save it as a custom template. To manage your custom templates, go to the Templates tab and select My Templates. 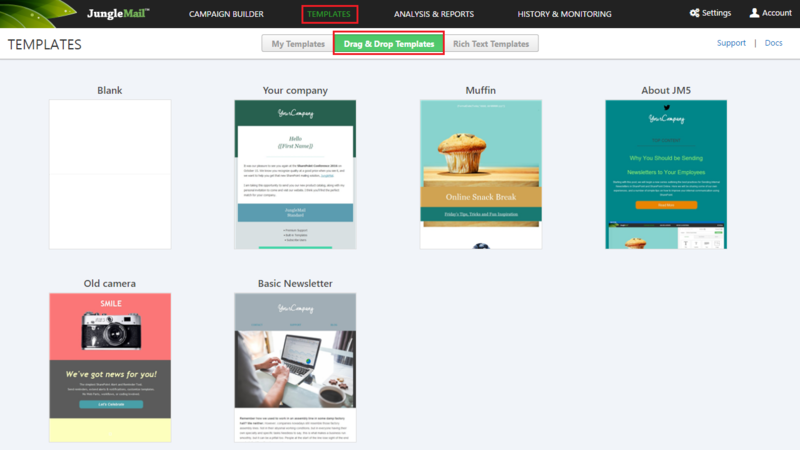 If you are creating a new campaign and want to add new templates, simply start by selecting the Campaign Builder tab. Now progress through the steps, until you get to the Templates tab. Here you can create a new template or choose an existing one. You can save your prepared content at any time whilst creating a new campaign, either as a template or an entire Job. To do this, click Save in the bottom right corner, and select one of the two options. If you select Save as template, you will save your content as a template to the My Templates gallery. If you select Save job , you will save the entire job with all of its configuration (such as selected recipients, email subject, etc). Saved drafts can be found by opening the Campaign Builder. This will automatically prompt you with the question if you want to continue with a previous draft, or if you would like to create a new campaign. You may want to move templates from one site collection to another. To learn more about exporting and importing templates, click here.